From the turquoise waters of Biscayne Bay and South Beach to the up-and-coming Design District and the historic Coconut Grove, Miami has long attracted the superyacht set thanks to its world class facilities, warm climate and buzzing social scene. Whether you’re looking to put down permanent roots in a Miami mansion, need a great family vacation home or are simply tired of renting during Art Basel Miami, our round-up of the most spectacular homes for sale in Miami is sure to satisfy your property needs. 252 Bal Bay Dr, Bal Harbour A modern home set to become a Miami property landmark, 252 Bal Bay Dr was completed in 2016 and designed by award-winning architect Chad Oppenheimer to offer seamless indoor-outdoor living. 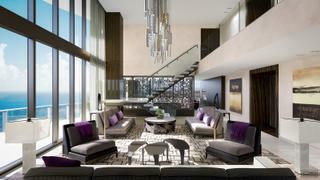 Situated in Miami's exclusive Bal Harbour community, the 17,000 square feet of living space boasts eight bedrooms, nine and a half bathrooms, plenty of spacious entertaining spaces with floor to ceiling windows, an open-plan dining room, a central courtyard with dining area and vast terraces and balconies. Outside, the garden offers direct access to the water as well as one of Miami's largest fish tank-style swimming pools. 252 Bal Bay Dr is listed for sale for $28 million with Douglas Elliman. From the turquoise waters of Biscayne Bay and South Beach to the up-and-coming Design District and the historic Coconut Grove, Miami has long attracted the superyacht set thanks to its world class facilities, warm climate and buzzing social scene. Whether you’re looking to put down permanent roots in a Miami mansion, need a great family vacation home or are simply tired of renting during Art Basel Miami, our round-up of the most spectacular homes for sale in Miami is sure to satisfy your property needs. A modern home set to become a Miami property landmark, 252 Bal Bay Dr was completed in 2016 and designed by award-winning architect Chad Oppenheimer to offer seamless indoor-outdoor living. Situated in Miami's exclusive Bal Harbour community, the 17,000 square feet of living space boasts eight bedrooms, nine and a half bathrooms, plenty of spacious entertaining spaces with floor to ceiling windows, an open-plan dining room, a central courtyard with dining area and vast terraces and balconies. Outside, the garden offers direct access to the water as well as one of Miami's largest fish tank-style swimming pools. 252 Bal Bay Dr is listed for sale for $28 million with Douglas Elliman. “Hibiscus Drive stands out because of its striking, ultra-modern architecture and extraordinary location,” says Sonia Gherardi, from One Sotheby’s International Realty. “Hibiscus Island is one of Miami’s most exclusive and private communities, highly desired by yachting enthusiasts who want to be in the heart of a city yet surrounded by water.” Built on a double plot in 2016, its striking angular design is packed with quirky features, including an exterior spiral staircase and glass walls. The modern layout of the five bedroom property means that all of the lower level can be opened to create one vast indoor/outdoor living space, with the ocean as backdrop. Gherardi’s favourite feature of the property is its expansive roof deck, which is equipped with a gourmet kitchen and offers sweeping ocean and city views. “This space sets the stage for entertaining on warm evenings with one of the most stunning sunset experiences in the city,” she adds. Island life can also be enjoyed from the infinity pool that flanks the property. The double lot offers 37 metres of water frontage and two docks, which could be used for one large boat. 370 S Hibiscus Dr, Miami Beach is for sale with One Sotheby’s International Realty with an asking price of $31.99 million. Built on a double plot in 2016, its striking angular design is packed with quirky features, including an exterior spiral staircase and glass walls. The modern layout of the five bedroom property means that all of the lower level can be opened to create one vast indoor/outdoor living space, with the ocean as backdrop. Gherardi’s favourite feature of the property is its expansive roof deck, which is equipped with a gourmet kitchen and offers sweeping ocean and city views. “This space sets the stage for entertaining on warm evenings with one of the most stunning sunset experiences in the city,” she adds. Island life can also be enjoyed from the infinity pool that flanks the property. The double lot offers 37 metres of water frontage and two docks, which could be used for one large boat. 370 S Hibiscus Dr, Miami Beach is for sale with One Sotheby’s International Realty with an asking price of $31.99 million. This waterfront estate on Palm Island was built in 1922 and has housed a succession of colourful occupants, including leading soccer agent Carmine “Mino” Raiola. However, prohibition-era bandit Al Capone remains its most famous resident. He bought the mansion in 1928 and spent $200,000 installing a gatehouse, seven-foot-high walls, searchlights, a cabana and a coral grotto (all to the displeasure of the locals). The house was restored in 2015 and now boasts a modernised four bedroom, three bathroom main villa, a separate two bedroom gatehouse and an 18 metre heated pool. “The combination of its rich history with the modernised villa is what makes it special,” says Nelson Gonzalez, vice-president at Christie’s International Real Estate. Despite its refreshed look, it hasn’t entirely lost its gangster feel. “Many of its original features have been preserved and are on full display,” says Gonzalez. “In the main villa, some of the most notable include the black and gold art deco powder room, the fireplace and the porch. The red grotto lighthouse, located by the gatehouse that Al Capone built, is also original.” The 30,000 square foot lot, which has century-old trees and more than 100 feet of waterfront on Biscayne Bay, is ideal for yacht owners. “There are no fixed bridges, so the new owner can have a large yacht,” adds Gonzalez. “Additionally, the property has its own private beach.” 93 Palm Ave, Miami Beach, Florida is for sale with Christie’s International Real Estate, for $13.5 million. This waterfront estate on Palm Island was built in 1922 and has housed a succession of colourful occupants, including leading soccer agent Carmine “Mino” Raiola. However, prohibition-era bandit Al Capone remains its most famous resident. He bought the mansion in 1928 and spent $200,000 installing a gatehouse, seven-foot-high walls, searchlights, a cabana and a coral grotto (all to the displeasure of the locals). The house was restored in 2015 and now boasts a modernised four bedroom, three bathroom main villa, a separate two bedroom gatehouse and an 18 metre heated pool. “The combination of its rich history with the modernised villa is what makes it special,” says Nelson Gonzalez, vice-president at Christie’s International Real Estate. 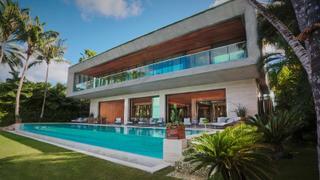 93 Palm Ave, Miami Beach, Florida is for sale with Christie’s International Real Estate, for $13.5 million. Looking for the best of both worlds? The penthouse at the super swanky 19575 Collins Avenue in Miami Beach offers all the convenience and glamour of city living without compromising on spectacular sea views. Designed by Charles Allem, the sprawling six-bedroom penthouse spreads across floors 43-46 offering 16,503 square feet of gorgeous living space. Highlights include an incredible 1,500 square foot master bathroom with steam room and sauna, 1,100 square foot games room and 10-seat cinema as well as a further five bathrooms and two half bathrooms, open plan entertaining spaces with incredible views over the ocean through floor-to-ceiling windows, balconies on all levels and a glass elevator leading to a rooftop sky bar with pool and waterfall. The penthouse at 19575 Collins Avenue is listed with Douglas Elliman for $29.5 million. Looking for the best of both worlds? The penthouse at the super swanky 19575 Collins Avenue in Miami Beach offers all the convenience and glamour of city living without compromising on spectacular sea views. Designed by Charles Allem, the sprawling six-bedroom penthouse spreads across floors 43-46 offering 16,503 square feet of gorgeous living space. Highlights include an incredible 1,500 square foot master bathroom with steam room and sauna, 1,100 square foot games room and 10-seat cinema as well as a further five bathrooms and two half bathrooms, open plan entertaining spaces with incredible views over the ocean through floor-to-ceiling windows, balconies on all levels and a glass elevator leading to a rooftop sky bar with pool and waterfall. The penthouse at 19575 Collins Avenue is listed with Douglas Elliman for $29.5 million. Located just outside the Miami city border, 8901 Arvida Lane is an expansive estate set across 2.38 acres of lush landscaped grounds and offers utmost privacy as well as excellent facilities for entertaining. Designed by Rafael Portuondo, the large main residence houses six bedrooms, nine bathrooms, a vast kitchen, formal dining room, office, cinema, wine cellar and roomy living spaces both inside and out. The property also boasts a fully equipped guest villa as well as an outdoor pool, garage and waterfront with private mooring and views over Biscayne Bay. 8901 Arvida Lane is listed for sale with Sotheby's Realty for $55 million. Located just outside the Miami city border, 8901 Arvida Lane is an expansive estate set across 2.38 acres of lush landscaped grounds and offers utmost privacy as well as excellent facilities for entertaining. Designed by Rafael Portuondo, the large main residence houses six bedrooms, nine bathrooms, a vast kitchen, formal dining room, office, cinema, wine cellar and roomy living spaces both inside and out. The property also boasts a fully equipped guest villa as well as an outdoor pool, garage and waterfront with private mooring and views over Biscayne Bay. 8901 Arvida Lane is listed for sale with Sotheby's Realty for $55 million. Another out-of-town option, this brand new home is surrounded by 228 metres of deepwater dockage within Fort Lauderdale’s Bontona Avenue peninsula making plenty of space for a superyacht. Offering six bedrooms and nine bathrooms, the plot was developed by Tom Bates and his wife, interior designer Katia Bates, whose firm is responsible for the bespoke design that combines modern convenience with artisan craftsmanship. “The quality of the build stands out from other new properties on the market due to the materials that have been chosen,” says Christopher Wands of Douglas Elliman. “Every marble and precious stone is hand-picked by the designers and developers.” If you are looking for a bedroom to match your master cabin then its 3,000 square foot master suite should do the trick. There is also a beauty treatment room, a gym and an outdoor pool. 529 Bontona Ave, Fort Lauderdale is for sale with Douglas Elliman asking $32 million. Another out-of-town option, this brand new home is surrounded by 228 metres of deepwater dockage within Fort Lauderdale’s Bontona Avenue peninsula making plenty of space for a superyacht. Offering six bedrooms and nine bathrooms, the plot was developed by Tom Bates and his wife, interior designer Katia Bates, whose firm is responsible for the bespoke design that combines modern convenience with artisan craftsmanship. “The quality of the build stands out from other new properties on the market due to the materials that have been chosen,” says Christopher Wands of Douglas Elliman. “Every marble and precious stone is hand-picked by the designers and developers.” If you are looking for a bedroom to match your master cabin then its 3,000 square foot master suite should do the trick. There is also a beauty treatment room, a gym and an outdoor pool. 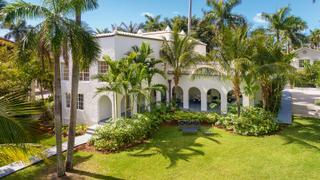 529 Bontona Ave, Fort Lauderdale is for sale with Douglas Elliman asking $32 million.